Efrain was born on June 26, 1926 in Huehuetenango, Guatemala. He attended primary and secondary school in the Guatemalan public system and started his career in the Guatemalan Army straight after graduation in 1942, and later enrolled in the Military Academy in Guatemala city in 1946. 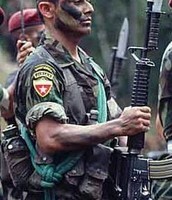 Rios received training from the Unites States Military academy where he learned the basics of counterinsurgency strategy, psychological warfare, torture and assassin. He excels in his training and is rapidly moved up in ranking, landing a spot as Army Chief of Staff in 1972. 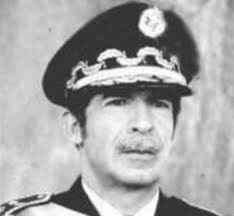 After a brief leave of absence Rios is asked to take the position as president of the military coup after the former president, Romeo Lucas Garcia, is deposed. He immediately instilled his dictatorship and created a disposition of the majority of the Mayan community against him. 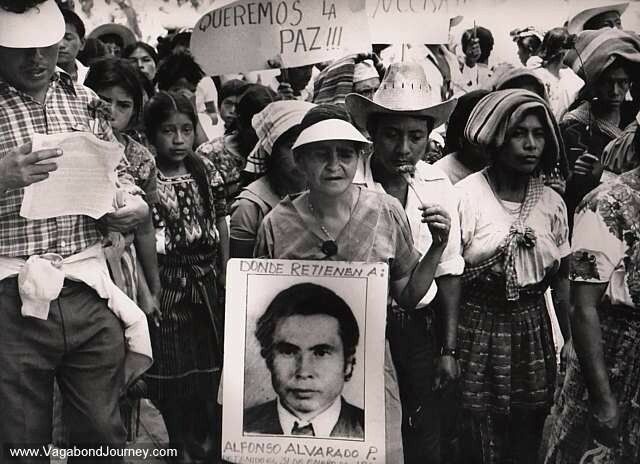 The government caught word of the small groups of guerillas planning a coup over Montt's regime and put into action what became the bloodiest fourteen years in Guatemalan history. Montt said, "if you are with us, we'll feed you, if you're not, we kill you." The army and paramilitary teams set out across 626 villages searching out the guerillas, or what they thought to be opposition. The village people were rounded up and gathered in the town squares where, if they didn't flee for refugee, they were brutually beaten and murdered. 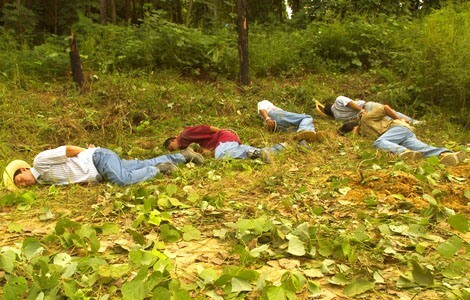 Bystanders were forced to watch or take part. Buildings and sacred monuments were burnt to the ground; livestock were murdered, crops were destroyed and water sources were soiled. Pregnant women's wombs were cut open and the women were shot, children were beaten against walls or thrown into death pits alongside the bodies of fallen adults; victims were raped, tortured, set afire and amputated, left to die slowly. The army also carried out planned executions and forced disappearances where death squads, often groups of criminals, killed suspected guerillas. Of all destruction and offenses against civil liberties and rights, the army was responsible for 93 per cent of the crimes and the guerillas, only 3 per cent. The U.S, throughout his reign of terror, supported Montt as they saw his efforts genuine in spreading democracy and social justice among the country. It gives me great hope for the future of the middle east to see such brave and bold efforts by your administration and you in creating a liberated and democratic society for the Guatemalan people. Contrary to what others may perceive as brutal and unjust, I recognize the tremendous need and appropriateness of your recent actions among the people and villages within your communities. 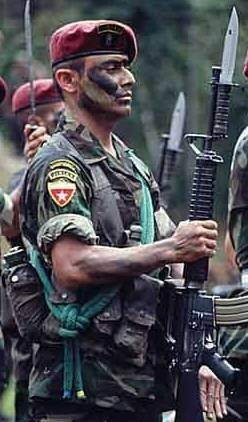 Your country is confronting a brutal challenge from guerrillas armed and supported by others outside Guatemala. I know that you are a man of great personal integrity and commitment; my government and I assure you that the United States is committed to supporting your efforts to restore democracy and to address the root causes of this violent insurgency. I know your intentions are to improve the quality of life for all Guatemalans and to promote social justice. My administration will do all it can to support your progressive efforts. This video is outlining the trial of Montt and his accusations of Genocide in Guatemala. He, unlike many other dictators, did not get away with his actions and has experienced U.S intervention. Although Montt has been successful at remaining in office up until now, the government has now turned against him and realized that what they thought he was doing to improve the country was really just him killing people for his own satisfaction and consolidation of power among the country. He has been convicted and will stand trial in 2015. He could be looking at 40 years to life in prison. He is currently 87 years old. Because of the vast improvement of Guatemala as a nation, are Efrain Rios Montt's actions justified? "Short Biographies and Background Notes on Heroes and Killers of the 20th Century." Moreorless : Heroes and Killers of the 20th Century. N.p., 1 Sept. 2001. Web. 20 Apr. 2014. "Who Is Efrain Rios Montt?" International Business Times, 22 May 2013. Web. 20 Apr. 2014.